I dunno about the Graveyard theme. This one looks pretty good.. Check the third one I added. I think it's the best so far. I played the latest version for a bit and noticed that the "temples" are occasionally referred to as "palaces" by NPCs. I'd suggest making it temple across the board to keep things consistent. Here is another thing that can be fixed. 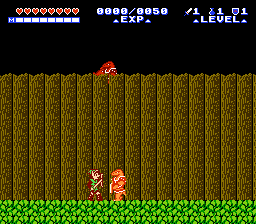 On the long bridge after exiting Death Mountain, the red moblin that appears is actually placed above the bridge. This makes it appear to be falling when you enter the scene. So here is a fix just like what we did with the basilisk and moa in East Hyrule. At 0x4931, change 20 to 22. This will move the red moblin to the right a bit so he doesn't spawn on screen. The left most tile has transparent pixels in it. This tile is used for the corners on the mountain, but there is a single tile in the center that uses it, as well, allowing the text to show. I'd fill the hole in with black, since it's in the palette. Did one final check for all dialog, for anything missed that could still be improved. Here are a few more suggestions I think would make the game feel more polished. Some hints could be a bit more detailed, providing better direction for the player. "GET THE CANDLE IN PARAPA, GO EAST TO THE NEXT TEMPLE." Find the candle in the parapa desert temple. Go north east. This one is more in line with what the lady says at the town entrance. About going north to the tunnel. "USE THIS MAGIC TO SURVIVE THE TEMPLE AT PARAPA DESERT." "USE TEMPLE KEYS IN TEMPLES WHERE THEY ARE FOUND." Use keys in the temples where they are found. "YOU FOUND A MIRROR UNDER THE TABLE." Move "A" to the next line for better spacing. "THERE ARE A PAIR OF SACRED GLOVES AT MIDORO SWAMP." The temple in Midoro Swamp has a pair of sacred gloves. Normally, there is no clue about which swamp is Midoro Swamp. By changing this, player's will know which swamp it is, because of the temple. "ONLY SARIA TOWNSFOLK CAN CROSS THIS RIVER." "MAY" instead of "CAN" just to have consistency with his follow up text. "THE RAFT IS AT THE ISLE TEMPLE TO THE SOUTH." "THE DOOR WILL NOT OPEN. IT'S AWFULLY QUIET." Something I didn't notice before. A lady in Mido town says a bell always tolls, but that contradicts this text. I believe the original game mentions the bell ringing. Perhaps make it more in line with that? "THE WALL READS... A TEMPLE LIES AT THE FAR EAST OF NABOORU." Perhaps add some lore to this? Why did they flee? Everyone fled from Kasuto when the minions of Ganon attacked. "A HEART CONTAINER IS ON THE SHORE EAST OF TRIPLE EYE ROCK." "CALL TO THE TEMPLE AT THE THREE EYE ROCKS IN THE DESERT." This dialog and the previous one, both mention the same place, but with different names. Make them both the same. 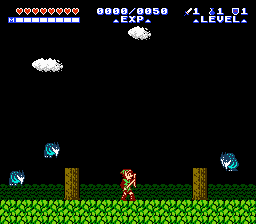 Use either "THREE EYE ROCK" or "TRIPLE EYE ROCK"
Updated the automatic Saria Bridge hack. The code is a lot more efficient and uses LESS space! I changed the original post with the new code, but here is a quote highlighting what's different. Remove all the old code first at 0x2CA0 and 0x2D70, and paste the new code at 0x2CA0 and 0x2D10. Here is another suggestion: With the recent changes to the palette for the fence, and trees, it'd be good to redraw the small tree stumps in the forest around Bagu's house. They are very bright now, and it doesn't look good. Already made all of the changes you specified. How about something like "THE DOOR\WILL NOT\OPEN.\ONLY THE\CHURCH BELL\TOLLS..." ? "FIND THE\CANDLE IN\THE PARAPA\TEMPLE,\THEN GO TO\THE WEST." ...? Other than that, I wonder if Link is never supposed to talk, as it's been the rule since... forever? Using "I" would then be contraindicated. This means "I found a mirror under the table" is prohibited, and maybe, if we stretch a little, the sign at the entrance of abandoned Kasuto. It's like Link himself is saying "strange... it is deserted", because it would be weird that someone actually wrote this on the sign. It seems like nitpicking, but hey. The Japanese version does about the same thing. I will rework the text so that it mentions getting the candle in Parapa, and then go west to the next temple. I will see what instances of "PALACE" are still in the game and change them to temples. How often do you update the beta on page 1? I might grab the next one once you upload the current changes! The beta in the OP is updated with every bit of change I make. Right now, all of the current changes (and proposed new lines in the last post implemented) have just been updated. The link is always the same, but the patch is updated often. So if you want to, try out the new beta patch, it should be the latest. Those sounds good! For the middle one about Ganon's minions, I think the suggested way "the minions of Ganon" sounds better, plus better spacing, but either one works! I'll grab the latest version and do some more testing! For that candle text, maybe you could do something like this. Having the town name in there makes it much better, and adds a bit more sense to the NPC's knowledge of geography - NPC's don't talk about other towns very often in the original game, so having more connections like that would be awesome. "GET THE CANDLE IN THE PARAPA TEMPLE, AND GO WEST TO RUTO." "THE TEMPLE IN MIDORO SWAMP HAS A PAIR OF SACRED GLOVES." There is no line break after "TEMPLE" making the rest of the text go outside the text box. Your re-write implies that the church bell tolls constantly, which I don't believe is the intent. From reading a direct translation of the original Japanese lines, I infer that the church bell tolls on the hour (or whenever's typical for church bells of Hyrule) which is mysterious to the townsfolk of Mido since the church is believed to be vacant. That's of course a hint to the player that there's someone still there that Link should try and talk to. I think the original text, roughly translated as, "The door won't open. It sure is quiet." is meant to invoke a creepy vibe, since a church who's bell still tolls despite being abandoned is definitely eerie. I think the current "awfully quiet" line fails to invoke a creepy vibe mostly because I can't help but think of Elmer Fudd from Looney Tunes. It's hard for me to suggest a replacement line since I'm not familiar with the text restrictions you must work with. How about "GET THE CANDLE IN THE PARAPA TEMPLE, THEN WEST TO RUTO." ? Or does it sound somewhat engrishy? You do bring up an important point. I think leaving it in some sort of mention to the silence might be good, and only when the NPC mentions that the bell tolls, that's when the hint should be given to search the church. We can work with 6 lines of 11 characters each. Commas, dots and spaces are considered towards that 11 character count as well. "THE DOOR" takes up 8 characters of length, and "WON'T OPEN." takes up the full 11 characters of the row, including the apostrophe. With that said, "THE DOOR WON'T OPEN." takes 2 lines, we still have 4 more (of 11 characters each) before we hit the limit of the text box. "GET THE CANDLE IN PARAPA TEMPLE, THEN TRAVEL TO RUTO." What do you think about Adam's suggestion? I think he does bring up a legit point towards that line. GET THE CANDLE IN THE PARAPA TEMPLE, THEN WEST TO RUTO. THE DOOR WILL NOT OPEN. IT'S AWFULLY QUIET. Lady: "THE CHURCH IN TOWN HAS NO PRIEST, BUT THE BELL DOES TOLL..."
Door: "THE CHURCH IS EMPTY, BUT YOU HEARD THE BELL TOLL..."
"THE DOOR IS LOCKED SHUT. THE ONLY SOUND IS THE BELL'S TOLL." "THE DOOR WON'T OPEN. ONLY THE BELL'S TOLL CAN BE HEARD." "EVERYONE FLED OLD KASUTO WHEN GANON'S MINIONS SIEGED IT." "FIND A CANDLE IN THE PARAPA TEMPLE, THEN GO WEST TO RUTO TOWN." Also did you fix Town Town? @IcePenguin, just updated the beta IPS with the latest points you mentioned in PM. Right the next day you mentioned it. Got the latest version and tested all dialog again. Everything looks solid, and makes the game feel more polished all around! Very nice! I'll do one last play through, testing other areas of the game, like dungeons, enemy placement, etc., and let you know if anything comes up! There is one last suggestion I have for dialog, but it's not really that important. The text you have in place now works perfectly fine, but an added pause would make it easier to read. In-game, the words, along with the commas and apostrophe, make it a bit awkward to read. Not really a big issue, but thought I'd suggest it as my final test for dialog. "PLEASE, MY DAUGHTER IS ILL, SHE IS AT DEATH'S DOOR!" Please, my daughter is ill... [pause] she is at death's door! At 0x10B74, change 09 to 79. This will place the red iron knuckle on the ground. "After getting the candle in Parapa Temple, from the West tunnel you can go to the next temple." That's right, all that information within 4 lines. The word shinden means temple, and kyuuden would refer to a palace. I prefer to use the term "palace", probably because I expect palaces to contain knights and skeletons. Temples are more like sacred places. And dungeons are dark and damp. @IcePenguin, suggestion taken and implemented. @Trax, so the original Japanese release also tends to shift around the wording between Palace and Temple? I think even the Smash Bros games have renamed the palaces to temples. One example is the "Great Temple" track in the Smash series, they renamed it from Great Palace. Still, if some people prefer them to be named "Palaces" instead of "Temples", I could make an additional patch that renames all references from temples to palaces. Just let me know what do you guys think.